One of the changes that take place in the body during meditation is the slowing down of the metabolism, i.e. the rate of breaking down and building up the body. There is a sharp reduction in the oxygen consumption and the carbon dioxide output. Up to 20% decrease in oxygen consumption during meditation have been measured because the respiration rate is slower. The reduced metabolic rate is due to the control over the involuntary nervous system which has been developed through meditation. Meditation also influences the blood pressure, which drops much lower than normal, both during and after meditation. Meditation is the perfect method of reducing the lactate level and, consequently, of reducing blood pressure and also anxiety levels. Medical tests show that the level of lactate is higher during stress, anxiety, and neuroses than when the individual is calm and tranquil. During mediation, the heart rate slows down, while the blood flow increases. The Sympathetic nervous system plays its role by constricting blood vessels, which in turn reduces the blood flow. During meditation, the activities of the sympathetic nervous system are reduced, and the constriction of the blood vessels is automatically decreased, resulting in a greater flow of blood. The stressful, competitive, modern way of life is such that an individual is always tense, in a state of fear, liable to large mood fluctuations and dissatisfied. This causes prolonged stimulation of the adrenal gland and the sympathetic nervous system and can lead to high blood pressure, diabetes, coronary thrombosis, peptic ulcer or a host of other ailments. The sure method to prevent or cure these ailments is to completely relax the whole body and mind through meditation. 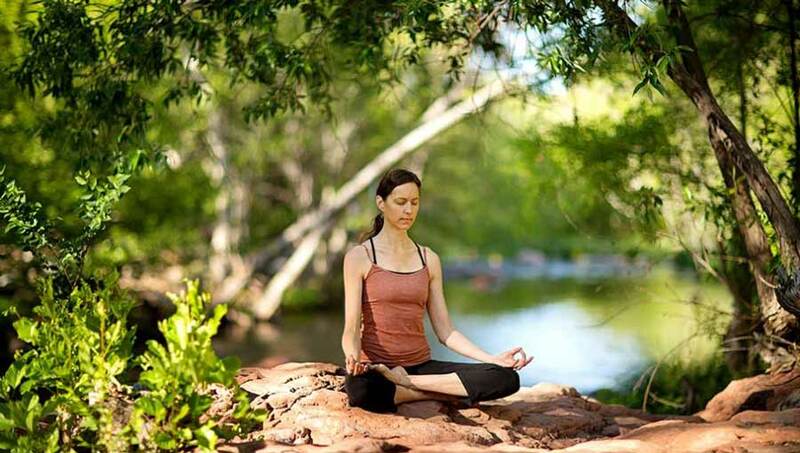 Regular practice of meditation helps reduce anxiety and anxiety-related mental health issues. Electroencephalograph (EEG) studies of the brain in those who are meditating show that meditation boosts the intensity of alpha waves which is associated with quiet and receptive states of mind. This relaxed state combats anxiety, and this is confirmed by research which has found lowered levels of lactic acid in the blood. (High levels of lactic acid are also the reasons for anxiety). Stress leads to inflammation, a state linked to heart disease, arthritis, asthma and skin conditions such as psoriasis. Relaxation through meditation can help prevent and treat such symptoms by switching off the stress response. In this way, meditation clinically improved the symptoms of psoriasis. Meditation improves the condition of a patient suffering from depression and creates for him a more positive outlook on life. Thus one can say that the aim of the meditation is to break down existing complexes, phobia, and prejudice-riddled mental program and replace it with a purified mental program. What is important is the regular practice. It takes only a few minutes every day. Make it a part of the daily routine, and that part (time) will become the best part of the day.